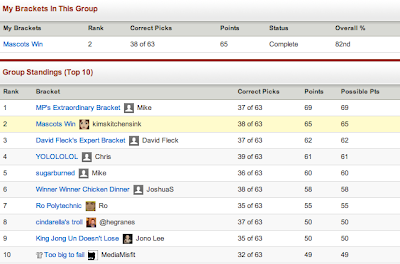 Once again, I've participated in this thing we call March Madness. This year, I took a chance and actually paid to participate in a bracket. With my coworkers. I picked my picks the way I always do, of course, based on mascots. I like to pretend the mascots are facing off against each other, and choose the one I think would win in a real life battle. Usually, I do better than my friends (or - ahem - husband) who take it seriously, considering player abilities and school seed and whatnot. It just goes to show you...that...um...it doesn't matter? This year? This year, I placed 2nd in my office pool. And I won $50*. HECK YEAH! Observe and bow to my greatness or whatever. Amazing. Proof that MASCOTS WIN, BABY!!! *actually $30, because there was a $20 buy-in.